Sure, a laptop computer is useful, and you’re probably going to need some bed sheets, but those items are standard necessities. Here, these are the underrated items that you absolutely must have for a happy and successful college life. Sometimes the dining room is closed, but that doesn’t mean you don’t want to eat. Keep a stash of microwave-friendly items in your res room and you’ll be the happiest kid ever at 2am. Find out immediately if your residence provides a microwave. If not, head over to your neighborhood’s garage sales and buy a cheap microwave from them. You’ll probably be able to upgrade as you move through college, but you definitely want one of your own, even if it’s from 1972. For hydration, and, you know, other stuff. But seriously, staying hydrated is one of the best ways to stay healthy, and water tends to give you energy. Also, it keeps you full when you’re bored and helps you avoid the vending machines between classes. If you get a nice bottle, you can even transport tea, coffee, cooldrinks, and soup from the dining hall to the library. But if you get caught, I never said that. There are days when you can hardly make it to the bathroom to brush your teeth, much less to the library for schoolwork. If you’re experiencing one such lazy Sunday, a lap desk is the solution to surpass all other solutions. You can stay in PJ’s and surround yourself with pillows, blankets, or stuffed animals, and still have a productive day. This is especially useful for those all-nighters when you’re hopped up on coffee but the library is closed. It took me two years to learn this one, and then I never looked back. 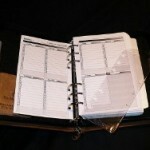 A planner is your lifeline in college. It’s one thing to skip class or shirk an assignment, it’s another thing entirely to mistakenly skip an exam or get the due date wrong. You should write all major due dates and exam dates in your planner as soon as you get your syllabi, and then at least you know they’re coming. Some schools will even provide planners for students, but most of us just throw them in the school-provided desk and forget about them. Never do that. 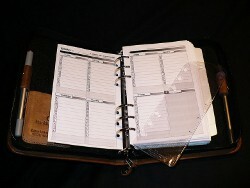 School-provided planners often have hard-to-find dates about Exam Week, campus actvities and public holidays. Planners are essential. My friends laughed when I received a gigantic first aid kit on the eve of my departure, but you would never believe the stories where that thing came in handy unless you lived them. Earning the nickname Doc, because of my unending medical supplies, was all in good fun, but it could also be a curse when my banged-up and bloody neighbor knocked on my door looking for some aid at 3am. I’d still say the first aid kit is a must, and you should make sure it’s chock full of Band Aids and Advil.